With labor force participation of both parents nearing 70%, childcare continues to be in high demand. Daycare centers are a popular choice as they offer opportunities for growth, learning, and development as parents work to support their families. Mangam is Landmark’s resident childcare property specialist working closely with the Department of Human Services that overlooks daycare licensing, requirements and changing policies. In the nearly two decades she has been a commercial real estate agent, she has been a part of over 30 daycare center transactions. 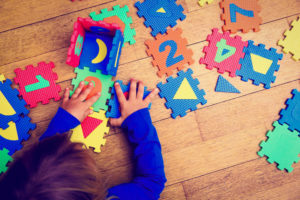 With the childcare industry booming from both an employment and revenue growth standpoint, entrepreneurs and business owners are looking to invest. Mangam says prospective childcare property investors should focus on finding sites that would be ideal for growth. Having a location that is near major roadways or highways allows a convenient drop-off and pick up for parents. If you are looking to open a childcare center, make sure you conduct a needs assessment. If you find a property that works but is in the middle of a rural area, you may need to keep searching. Also, it is essential to determine the cost of transitioning any building into a daycare center and who is paying for renovations. It can be very costly, especially adding sprinkler systems which is a requirement for most new facilities. Children need to get outside and be kids. Ample room for a playground (or two) is a requirement for a successful daycare center. Daycare centers require many employees, so it is always convenient if a center is in a walking distance to public transportation. Having a center located near a bus stop or train station can be an advantage if the opportunity exists. Currently, Mangam concentrates a lot of her time and efforts working with operators that have been in business for a while and are looking to open another facility, but she is always eager and willing to help those that want to enter the industry. Mangam feels that a great location, a detailed business plan, and a skilled, well-trained staff are the foundations of a successful daycare center. “Daycares are an investment in the future – our children’s future,” adds Mangam.